There is a legendary pie company in Melton Mowbray who run a special pork pie shop in the town called 'Ye Olde Pork Pie Shoppe'. This puts them in pride of place in the home of Melton Mowbray pork pies. This company goes by the name of Dickinson & Morris and has been baking pork pies since 1851. This means they are the oldest remaining baker of traditional Melton Mowbrays in the town. In 1992 they were bought by Samworth Brothers and their pies can now be found in Nationwide supermarket chains. They are still some of the best Melton's around, with Dickinson & Morris often winning at the British Pie Awards. They also play a large part in the organisation of the British Pie Awards being one of the few members of the Melton Mowbray Pork Pie Association which is based in Melton. We have already reviewed their pork pies, giving the Mini Melton Mowbray 'Pierate Highly Recommended' status. You might think that this is it for Dickinson & Morris reviews as they only make pork pies. However, we recently reviewed their Creamy Chicken pie giving it 'Pierate Recommended' status which shows there is more to Melton Mowbray than just pork pies! They also do a range of different sizes of pork pie. I can understand that some might question whether we should give a separate review to a different size of the same pork pie. But this would be to forget one of the most important aspects of our Seven C's scoring system which is the Capacity of the pie. A different size pie clearly has a different Capacity and hence a different filling to patry ratio. The filling to pastry ratio is integral to what makes a pie special and finding the right balance is part of the Holy Grail in producing the ultimate pie. 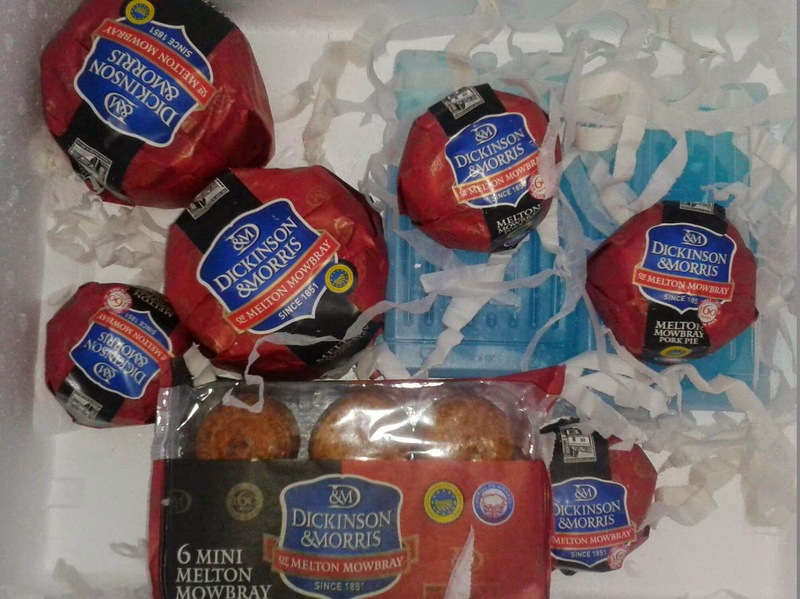 Hence, after Dickinson & Morris were so good as to send a box of pies to support our pie for every meal challenge I thought they deserved another review! Having sent 16 pies, in 5 different sizes you will be pleased to know I am not going to review them all (that would be tedious), but just my favourite. I ate this pie for lunch on Day Three and Day Seven of the challenge. Have a look at the videos below to see what I thought. I don't know if anyone else feels the same but I prefer to have a small pork pie rather than a slice of a big pork pie. There is something satisfying about biting into a whole pork pie which you don't get with sharing a big pie. There is also a more equal filling to pastry ratio with the smaller pork pies, whereas the big pork pies are dominated by the filling. A bigger Capacity isn't always better, it is about getting the perfect filling to pastry ratio. I find that the Individual size pork pie gets it just right. The mini pork pies reviewed before could do with being a little bit more satisfying to be the perfect pie, but hey, that is exactly what the individual pork pies do! Other than that, it is the same peppery flavour that the small version had. To find out more about what makes a Melton Mowbray Pork Pie special, see our 'What is a Melton Mowbray Pork Pie?' article. Condition - 7 out of 7 - Pork pies in the post but in perfect condition, why not buy online at www.porkpie.co.uk? They look delightfully rustic, despite now being mass produced. Colour - 7 out of 7 - I can't imagine a better Colour for a pork pie, a deep, crisp brown. Cheapness - 4 out of 7 - £1.30 online, sometimes cheaper in supermarkets, not the cheapest but decent value for a 140g pork pie which packed in 542 kcal. Capacity - 6 out of 7 - This pie had a great pastry to filling ratio but lost some appearance points due to the air gap which could have been filled with more jelly. It contained 38% pork. Chewiness - 7 out of 7 - The perfect contrast in texture from crunchy pastry to soft filling. Content - 5.5 out of 7 - A great balance of flavour with these pies being better seasoned than most. Hard to score a pork pie a full score for content.